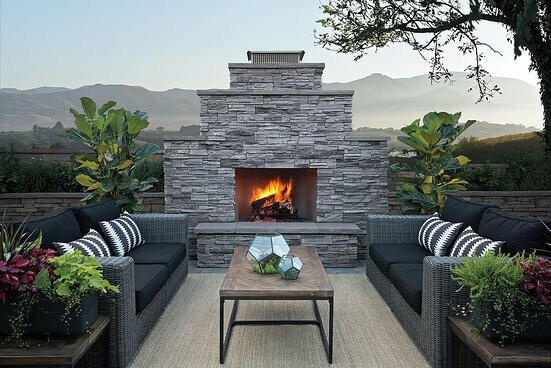 Thanks to many exciting new styles and designs in outdoor fire pits and fireplaces today, you can have a unique feature crafted to match your home's personality. Whether for cooking, entertaining, or relaxing, you have many options to choose from. It will become a true extension of your home and provide year-round entertainment. 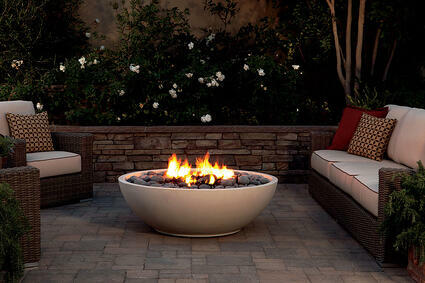 First, find out if there are any local ordinances that will restrict the installation of a backyard fire feature. Then, decide whether you want a wood-burning or gas-burning fireplace. Perhaps the most appealing things about a wood-burning fire pit or fireplace are the dancing, glowing flames and the distinct crackles and smells. This is the ultimate, almost primitive, outdoor human experience. Of course, there's some work involved with burning real wood: chopping (or buying) and storing the wood, and cleaning up the ashes. But that's the trade-off necessary to get the full campfire effect. inviting, back-to-nature setting for your family and friends. Types Of Fire Featuresr instant ambiance, and when you're done there's no fire to extinguish or messy ashes to clean up and dispose of. Whether you choose a traditional wood-burning feature or the ease and convenience of a gas one, there are a multitude of options when it comes to deciding what style of fire feature you want. After the final touches and decisions have been made, the only thing remaining to do is invite family and friends to gather around the fire for an enjoyable evening.